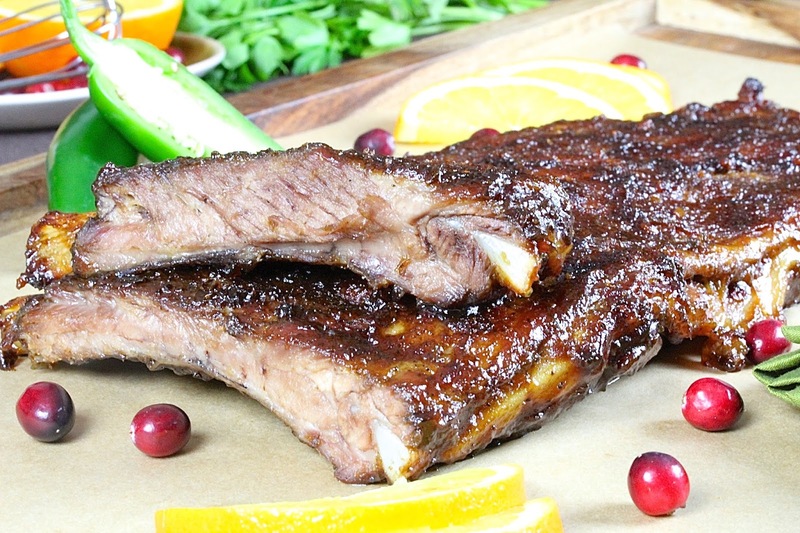 Sticky Cranberry Orange Glazed Pork Ribs are slow roasted and tender fall-off-the-bone good! 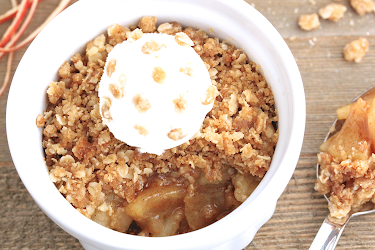 They are perfect for the holiday season but you are going to want them all year long! Hi there! So, have you started your Christmas/holiday shopping? Were you one of the brave souls who dared to stand toe-to-toe with intrepid Black Friday shoppers who were on a mission to go home with prime items at rock bottom prices? If so, I hope you had a successful shopping trip! As for me, I opted out on the whole post-Thanksgiving Day ritual again this year. In fact, I was at work, but don't feel bad for me. It was a quiet and fruitful day at the office, quite nice really. Guess what? If you read my last post, I contemplated asking Santa for a food processor for Christmas since mine did not puree well. Little did I know that Santa read my post! A few days after it was published, a food processor arrived at my door! Santa reminded me that I had a birthday and the food processor was a birthday gift. So thanks to the jolly old man in the red suit and the new kitchen gadget, my Ginger Cinnamon Sweet Potato Bisque With Smoked Paprika Pecans will be lumpy no more! I hope St. Nick is a regular reader of this blog. Here's to making wished come true, Santa baby! Now, what to say about these ribs? They are fabulous!! I served them to the family and four out of four gave them a solid stamp of approval. No surprise they were scoffed down in record time! It's easy to see why. Seriously, who doesn't like slow roasted, fall-off-the-bone pork rack of ribs? And the glaze is something to write home about! The tartness from cranberry sauce, the citrus note from orange juice, the sweetness and stickiness from molasses and brown sugar, the depth of flavor from soy sauce, and the slight kick from jalapeño peppers all work together to create a finger-licking-good glaze. If you are not a fan of heat, don't change the channel! There is not a whole lot of heat in the glaze, but if you must, reduce the amount of jalapeño. Or, omit it altogether. Your ribs will be DELICIOUS without the kick. I'm certain that these ribs will be making regular appearances at my house this holiday season (and beyond). 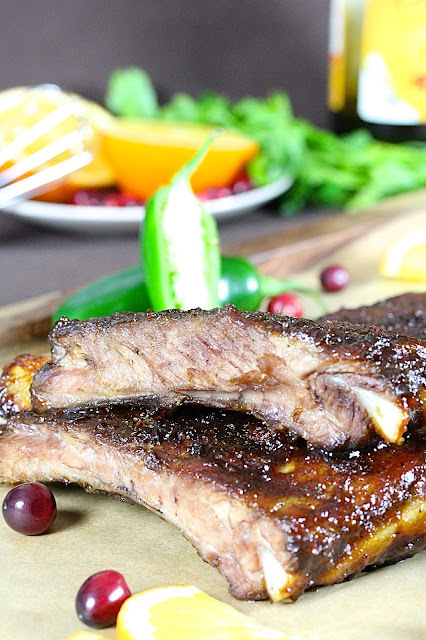 Let's not forget, sticky, meaty ribs are perfect game day food as well. These are a surefire crowd-pleaser. Make them soon, and make plenty! Just have plenty of napkins on hand! Remove the silver skin from the underside of the rack of ribs: slide the tip of a sharp, pointed knife between white/silvery membrane and the bone/meat. Lift and peel 1/2-inch or so of the membrane away from the bone/meat. Grab the loose membrane with a paper towel and peel. The silver skin may come off in sections. Continue to remove each section until all or most of the silver skin has been removed. Discard silver skin. Combine Kosher salt, pepper, garlic powder, onion powder, and thyme in a small bowl. Rub on all sides of ribs. Place ribs in the center of a large sheet of foil. Bring foil together to tent the pork, pinching the edges together and folding them over to create a tight seal. Pinch, fold, and seal foil ends. Transfer to a baking sheet. Refrigerate for 4 hours or overnight. Remove ribs from refrigerator 1/2 hour before placing in oven. Preheat oven to 325 degrees F.
Keep ribs in foil and on the baking sheet. Roast for 2 hours or until ribs are falling off the bone tender. 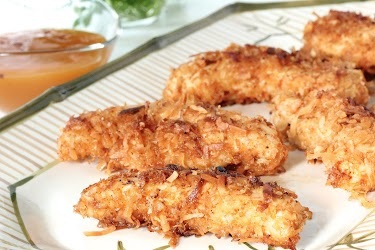 If the meat is not tender and the bones do not easily pull away from the meat after 2 hours, cover and return to oven. Continue baking, checking for tenderness after 30 minutes. About 30 minutes before the ribs are done, make glaze. Place cranberry sauce in a small saucepan on medium heat. Stir, using a whisk as cranberry sauce starts to liquefy. Once cooked down to a liquid, add the remaining glaze ingredients, stirring constantly. Bring to a boil. Reduce heat to medium low and simmer until sauce thickens and reduces by half, (about 15 minutes). Remove from heat. When pork is fork tender, drain all of the liquid from foil. Fold foil down flat onto the baking sheet. Turn oven to HI broil. Turn ribs over with the underside facing up. Brush with half of the glaze. Broil until bubbly and slightly charred (about 3-5 minutes). Remove from oven. Turn ribs over with meaty side up, brush on remaining glaze. Return to oven, broil until bubbly and slightly charred. Ribs, ribs, ribs, I can never get enough! This glaze is amazing and love the jalepenos for a little kick! Fabulous! Take care. By all means, make your own cranberry sauce :) I used the canned stuff to keep the recipe simple, plus I wanted a smoother texture of the store bought kind. If you like heat, add more jalapeño than what the recipe calls for. I kept the spiciness on the weaker side for those who are sensitive to spicy food. I'm glad Santa reads your blog and got you a food processor! 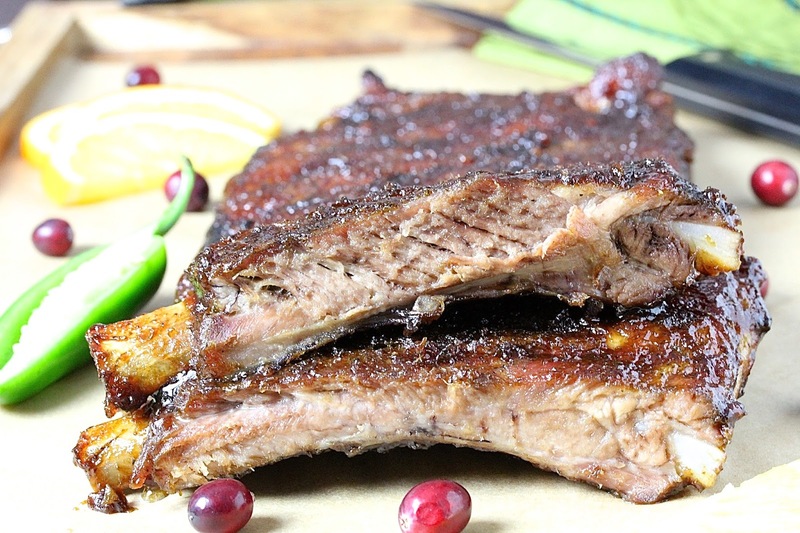 ;) Anyway, these ribs look mouthwatering! 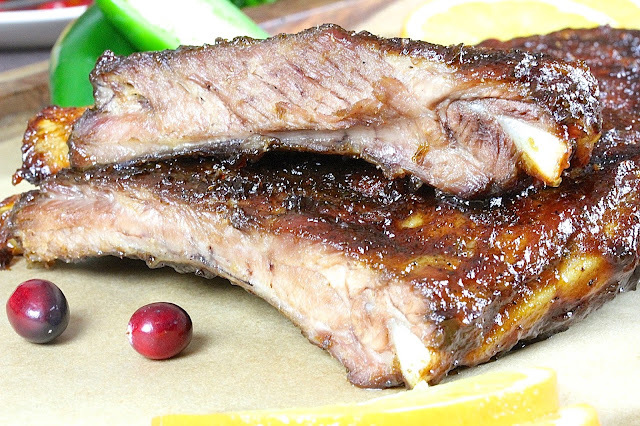 Cranberry orange glaze sounds so good and the ribs look perfectly fall off the bone. Thanks Marie! I plan to make another batch soon. That Santa is an okay guy ;) I won't hold my breath on the kitchen upgrade though, haha! Hooray for a new food processor!!! That would sure put a smile on my face. The nice thing about having a birthday around this time of year is that it's double the gifts all in one go ;) These ribs sound sooo good - you had me at fall off the bone! It was a nice surprise! I don't think the kitchen upgrade is going to work out the same way :( That fall off the bone part always gets me too! How sweet of Santa haha you must be loving your new food processor!. Those ribs look SO good I think I'll be adding some new ingredients to out shopping list this week. Thank you for the recipe! 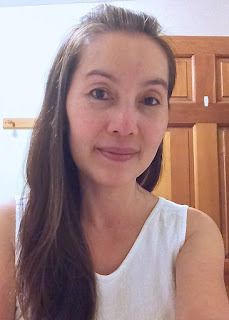 I love my new food processor :) I hope you'll try these ribs out, Paul! Thanks for stopping by! Yaaaay for new food processors! And yay for these ribs. I love all things cranberry and orange! I love ribs. Any kind of ribs, but especially sticky ones. I have some baby-backs in the freezer from my fav local farm so will be getting them out soon to try your recipe :) Happy holidays! Just tell me when and what time! I'll bring the wine!! 😄 Happy holidays to you too, Karrie! !